Kids under 10 years of age are free. 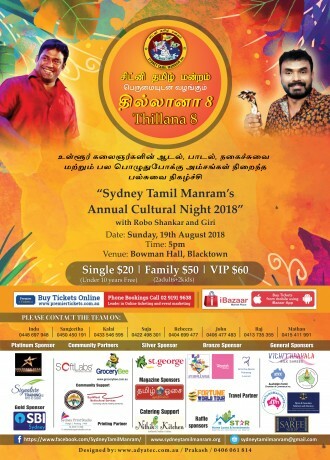 Thillana is an annual concert conducted by Sydney Tamil Manram it is stepping into its 8th year in grand fashion and is in a new venue to cater more patrons. This year the multi skilled performers Robo Shankar & Chennai Giri are on board to make it more grandeur. This established combo will definitely will tickle our funny bones and make us roll on the floor laughing and whats more? Sydney’s finest local talents are set to amuse with their talents. This event is organised by non-profit volunteers who work for the benefit of the community. Come support all the artists and have a fun filled laughter night. Our Community partner www.grocerybee.com.au is offering 10% & 15% discounts on their online shopping for every General & Family tickets purchased respectively. This is valid till 31st August 2018. Premier Tickets is an online event marketing and ticketing agency. Premier Tickets will NOT be responsible for any changes related to the event schedule, artist, venue or cancellation and refunds related to the tickets for Thillana-8. 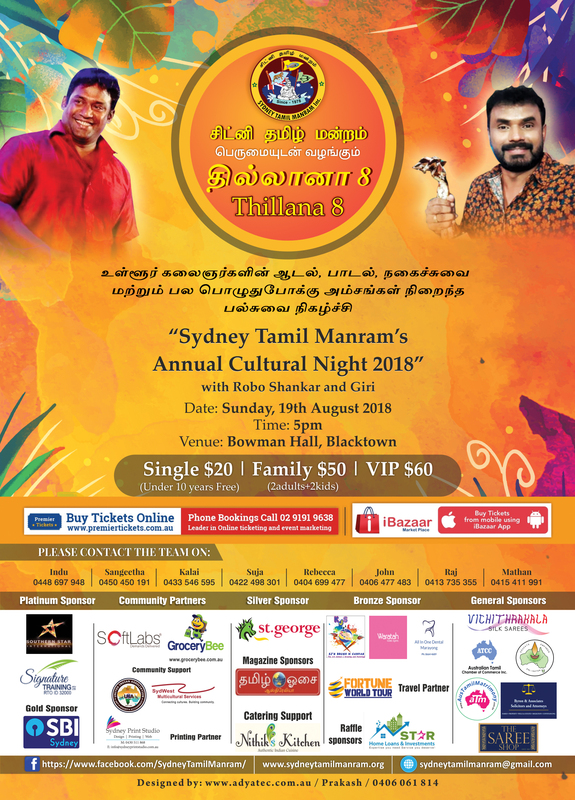 Premier Tickets Australia is proud to be the online ticketing partner for Thillana-8 on 19th August 2018 @ Bowman Hall, 21 Campbell Street, Blacktown, NSW 2148.